This one will be short because the alternative is that it be very, very long. The short version is that our brain does a lot of work we are not consciously aware of to make sensory input make sense. More than that, different input takes a varying amount of work, and the areas of the brain that do that work can become exhausted to the point they cannot function, just like a muscle. The tests for sensory integration issues involve stimuli specifically designed to overwork these regions and observing what fails first (each region producing different characteristics mistake). People with sensory integration issues find this processing more taxing- either because they’re fed more or noisier input, their brains have a lower capacity, or their brains are attempting to do more processing on the data. My most obvious symptom is some noise sensitivity, but there’s also a school of thought that sensory and digestive issues are linked. I wish I could tell you more on this, and I will, eventually, but I don’t have very good sources. My (now ex-) sensory integration therapist gave me a book that referred to thimerosal causing autism as if it was an undisputed fact. * I’d burn it if the exercises weren’t so helpful. So we’re going to put a pin in this and I’ll tell you more when I know it. I mentioned sensory issues and digestive issues appear to be linked. Some of it is that a lot of sensory issues seem to relate to the trigeminal nerve, which is also involved in chewing. If the issues make chewing unpleasant, people won’t do it, which has a lot of gastrointestinal consequences. But there’s more than that. I’m reading a book called The Second Brain, which I will undoubtedly have more to say about when I’m more than five pages in. But already it’s discussing the enteric nervous system and how it appears to perform complex, coordinated behaviors without any input from the brain or spine. ** This tickled something I found in my research on the gastric system: the vagus nerve. I have only minimal neurology, so take this description with a grain of salt, but: the Vagus nerve is a nerve collection that goes straight from the brain to certain parts of the body, without going through the spinal cord. Those parts? The digestive system, the heart, some reproductive and sexual organs, and the trigeminal nerves. This is a long way from conclusive, but it is does suggest that time spent studying the vagus nerve could benefit me. *There was a time you could argue that this was a possibility. That time was before the data conclusively disproved it, or the revelation that the original data was faked. **It implies that the enteric system is unique in this. I have a vague sense it’s not, or at least that I’m misrepresenting what is unique about it, but I’d need to research it to be sure. I have a hard time adjusting to new foods. I have to start with very low amounts and ramp up very slowly over time- which rules out anything that needs prep. I also have fairly severe texture issues that are hard to work around. On the advice of my excellent nutritionist, I started making and freezing stock. Making it is simple. You throw whatever food you want into a big pot with enough water to cover them, and a little bit of apple cider vinegar. Simmer for 6-18 hours. Let it cool for a bit, then strain the pot into another bowl, so you’re left with just the liquid. Pour that liquid into an ice cube tray. Now you have an ice cube full of nutrients. When I first started, I would chip off an infinitesimal amount into a huge glass of water and drink it over a period of hours. That’s not a lot of nutrients. But as long as my stomach (by which I really mean the whole GI system) was in lock down, that was all it was going to take in, regardless of what I gave it. So I don’t view the low nutrient concentration of the ice cubes, relative to food, as a failing. I view it as meeting my stomach where it was. For bonus points, drink it through a straw. For reasons I can only speculate on, I experience less stress and more nourishment when drinking through a straw, relative to eating or drinking straight from the glass. I alluded to this yesterday, but I want to make it explicit: in some ways, I am very very lucky. I have amazing health insurance, and a job that only pays well, but has extraordinarily flexible hours. I live in a big city with a lot of medical providers. I have a lot more resources to heal myself than most people, and I’m grateful for that. High protein or fiber foods felt like they just sat in my stomach. I felt nauseous and just generally icky. For you World of Darkness fans, imagine a vampire ate human food. That is what it felt like. High protein meals in particular often gave me a headache. These symptoms were noticeably better if I had soda with the meal. There were years I lived on spaghetti and tomato sauce. Tomatoes are highly acidic. Blood sugar issues. My fasting blood glucose level tests always came back perfect, except for the fact that I was emotionally destroyed by them. I tended to crash after more than an hour without food. My ex-boyfriend (we broke up almost five years ago but remain very good friends) still gets a haunted look if you mention me with low blood sugar to him. Despite this, I was really bad at anticipating hunger. By the time I noticed, the pin was already out of the grenade. I always felt insecure about food, even though I’ve always lived in a home with a full fridge. Low cortisol levels, especially in the morning, but cortisol too high at night. I could feel like I was starving at the same time I felt disgustingly full and bloated. I had been on the HCl for almost 9 months before it occured to me food could be a solution for hunger. Poor dental health, despite having the best care money could buy since infancy. A running list of nutritional deficiencies. I was seeing a “functional medicine” doctor (with an MD), who spotted and treated the nutritional deficiencies and hormonal issues, but not the root cause. I’ll admit most of the symptoms are pretty nonspecific, but I did bring the soda thing to her. Some time later, I was referred to a psychiatrist for possible anxiety issues. I think that psychoactive drugs are invaluable when necessary but also pose some serious risks, and should be used with caution. I found a psychiatric ARNP who advertised a nutritional focus and talked to her. She listened, and suggested that I might have an anxiety disorder, but she also saw signs that I might be incapable of digesting food, and that that could be contributing. There’s are several ways to test for hypochlorhydria (also called achlorhydria). There’s some expensive, highly technical ways involving an endoscopy or a pill with a pH lab and a radio transmittor. Or you can take an HCl supplement with a protein heavy meal. If you don’t get heartburn, congratulations on your newfound diagnosis. I listed the improvements in my health in the last post, so I won’t repeated them. I don’t want to exaggerate, so let me be clear that HCl pills did not magically fix everything wrong in my life, or even my body. But they improved a lot of things, and they laid the groundwork for other interventions that cured other things. HCl supplements are not the only treatment for low stomach acid. Dr. internet also recommends Apple Cider Vinegar. I tried it and found it burned my throat, but that could be related to the long term heartburn I had. * There are also digestive enzymes: I found them useless before I started HCl, but they’re occasionally helpful now. Of course you’d ultimately like to know why your stomach acid is low. That was the first question everyone asked me when I told them my new diagnosis. I was completely uninterested. I had only just gotten access to a source of sustenance that the rest of the world took for granted, and I spent several months just luxuriating in that. But eventually, I was ready to dig deeper. There was a gap between when I was emotionally ready and when I actually did the tests, because they’re super unpleasant. The first one was a stool sample. I’m not so squeemish as to put off medical care because eww poop, but getting the sample was a logistical nightmare. It needed to be mailed overnight after collection, which means a weekday. I probably have one of the most flexible, understanding offices on the planet, but I still didn’t feel right organizing a stool sample in the bathroom. Maybe if I could have mailed the whole stool, but the test required me to take samples from several different parts of feces (so it’s representative) and mail in just those. So it took a while for me to manage that. Eventually I did, and they tested me for many different things, and I came back positive for Heliobacter pylori. We’ll cover the science more in a future post, but the short version is my doctor put me on some unpleasant herbs for a month. Since then I feel better but am not using noticeably fewer HCl pills. The second test was for SIBO (small intestine bacterial overgrowth). SIBO is one of the reasons we can’t just label bacteria good or bad, because it refers to bacteria that are healthy and necessary in the large intestine moving into the small intestine, where they smoke and curse and litter. The SIBO test is terrible and I hate it. To prep for it you need to go 12 hours on a very restricted died (basically rice and eggs), and then 12 hours of fasting, and then three hours breathing into tubes (still fasting). I can’t go more than an hour without eating at the best of times, but I stupidly did this two days after finishing the unpleasant herbs for H. pylori treatment, and all I wanted in the world was fiber. I spent those 27 hours miserable and angry and physically shaking with hunger. It took me a full day after the fast to be able to leave the couch. After all back, the results came back indicating a mild SIBO infection. I can only do so many things at once and I had more pressing issues at the time, so I put off treatment for the month. Treatment in this case means “antibiotics that cost more per day than many people earn.” The other choice was to live on specialized diet shakes for weeks. I have severe emotional issues around food and excellent insurance, so expensive antibiotics were the right call for me. I would like to tell you how that went, but as of the time I’m writing this I’m only halfway through treatment. I should be done by the time this is published**, but it may take weeks to identify the effects. So for now I will dig into the relevant science. Coming up: the science of H. pylori and SIBO. *Probably caused by food allergies, not low stomach acid. **I wrote the set of digestive posts more or less simultaneously, because it wasn’t clear how the information should be organized until I’d done it. One of the goals I outlined for this blog was sharing stuff that helped me, whether or not there was rigorous research to support it. This is one of those. Cut any vegetable into bite-sized cubes. If you’re not sure what to use, start with colored potatoes, which have a fairly neutral taste and more nutrients than Idaho potatoes. Put tin foil on a baking sheet or brownie pan. Dump the cubes onto the tin foil. Put in a little bit of olive oil, and a lot of a pre-made spice mix (example). Mix the cubes up with your hands so the olive oil and spices are evenly distributed. Put in over at 350 degrees for 45 minutes. Or 400 degrees for 90 minutes. This let’s me get some variety in taste (by rotating spices) while sticking with a known-safe vegetable. Or I can make a new vegetable safer by putting a known good spice on it. It’s also very, very forgiving. Boiled vegetables have a very narrow range of edibility. Two minutes too little and they’re too tough, two minutes too long and they’re gross and slimy. Roasting probably has some sort of ideal temperature and duration, but can tolerate huge variations in length and temperature and still be pretty good. It’s time efficient. There is a bit of a wait between prep and eating, but prep is relatively short, it reheats well so you can cook a big batch when you have the time and eat it when you don’t, and clean consists of throwing out the tin foil. If you’re able to throw money at the problem, you can even skip the chopping step with a food processor. It’s also pretty amenable to experimentation. Most people like to seal up the foil because it holds in moisture. I leave it open because I like them dry. Temperature and time also have a great deal to do with it, and you can play with them secure in the knowledge you will be able to eat it even if you guess wrong. People who like having more than one thing at a time (weirdos) can put in multiple veggies. So that’s my go to meal. It is not everything, but it makes me feel nourished without making me anxious, and that’s more than I could say for most food. *This could easily be my bacterial flora overadapting, ort hat I’m more likely to recognize new food as food and kick off the digestive process. Helicobacter pylori is a bacteria found only in the gastrointestinal tracts of humans and closely related primates. When I say in the stomach, I mean in the stomach. H. pylori burrows into the mucous coating your stomach and touches the epithelial cells. 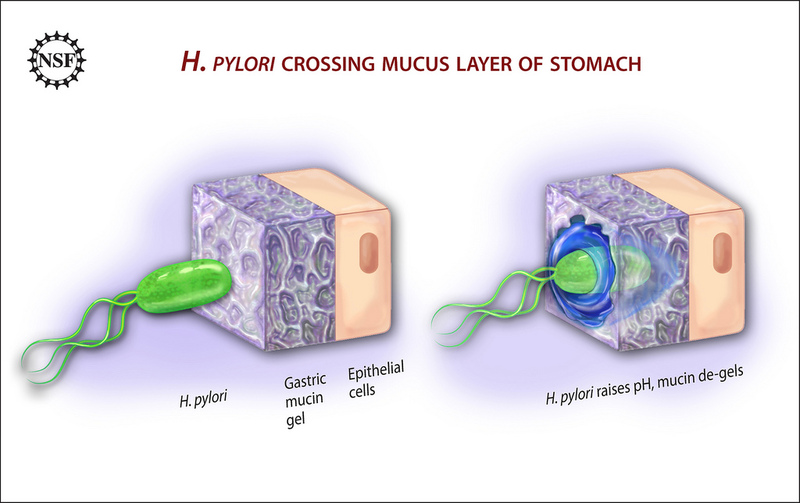 Fun fact: in the presence of acid, the gastic mucous hardens in an almost solid shell, which H. pylori cannot penetrate. It works around this by preferentially seeking out high pH areas within the stomach, and by releasing ammonia to neutralize the acid. So H. pylori can be both a cause and consequence of low gastic acid. This fits in with my general view on physical processes and life in general: everything either stops on its own or is part of a self-reinforcing loop. H. pylori is most famous for causing gastric ulcers. This was especially important because it was a beautiful example of something previously considered a “lifestyle” disease having a distinct, exogenous cause. I use it as a go-to example of medical science not respecting its limitations. Alas, my example was itself oversimplified not respecting its limitations: only 60% of ulcers are caused by H. pylori. Half the remainder (20% of the total) are caused by NSAIDs, and other half are caused by “Other”. I do wonder how they’re determining presence. I had two different H. pylori tests done (both on a stool sample), and only one cam back positive. Putting this on the list to investigate further. The coolest cause I found was Zollinger-Ellison syndrome, in which tumors made of gastrin-secreting cells cause an overproduction of gastrin. This is how I learned they can test for gastrin levels directly, which I am curious about given its likely contribution to my digestive issues. H. pylori also raises your lifetime risk of stomach cancer, but only by 0.6 percentage points. Despite that scary sounding list, 80-85% of infected people show no symptoms. That may be due to genetic differences in the bacteria infecting them. There is also research suggests that H. pylori is, or at least was, mutualistic with humans, and that lack of it increases a person’s risk for gastrointestinal issues. If that is true, the question becomes: is this pathogenicity -causing-strain new, or has it always been present, and only recently became dangerous? H. pylori treatment protocols commonly include proton pump inhibitors , which make the stomach less acidic. This struck me as a rather interesting choice for fighting a pathogen that prefers high-pH environments: apparently the goal is to coax the bacteria into areas more easily reached by antibiotics. Confession: I thought that the stomach had a thriving bacterial ecosystem, of which H. pylori was an unwanted guest. It turns out I was thinking of the large intestine. Almost nothing survives in the stomach, and of the things that do, it’s unclear that establish permanent residence, much less are mutually beneficial. I’ve referred to the scientifically questionable book my scientifically questionable sensory integration therapist gave me before. It’s name is The Fabric of Autism. Let me walk you through its loss of credibility. As I mentioned before, TFoA refers to the hypothesis that thiomersal causes autism as accepted fact. That is a very big strike against it. But all the best theories were once fringe hypotheses, and people who believe one fringe hypothesis will often believe another, so I kept reading. Then TFoA referred to information the author received from patients using Facilitated Communication, accepted as naturally as if the patient spoke. I vaguely remember FC from a psych 101 class I took in 2004: FC was a breakthrough that allowed autistic people to write out their thoughts, thoughts mainstream practioners had denied they even had. People thought to be entirely nonverbal were writing novels. It was a miracle. Only FC was being used by people who had never learned to read or write. You can pick up verbal language without explicit instruction, but not written. And even if you could, autists were writing full sentences without looking at the letters- and the FC hunt-and-peck method is simply impossible to touch type with. FC went on to fail every double blind trial thrown at it. In the time between introduction and discrediting, several people were sent to jail for sexual abuse, where the only evidence was FC-expressed accusations. I checked wikipedia, and my recollection was more or less correct. They present it as more controversial and less laughably terrible than my class, and it’s always possible new research was done or the technique has changed since I took my class. Or maybe it just happened to work for these individuals. But given how horribly misused faciliated communication was in the past, I believe the author should note that history and what makes this FC different from the bad old days. Failure to do so is strike two. Then the book had a good stretch. It posited some plausible mechanisms for how sensory and inner ear problems could hurt the digestive system. Then it tried to do the reverse. I’m well disposed to this sort of thing. Anything that isn’t self-reinforcing will stop. But the mechanism proposed was that poor digestion leads to bad posture, and that causes the endolymphatic sac in the ear to underinflate (this is what we spent so much time on Wednesday). I can’t prove that doesn’t happen. But I am very, very certain that bad posture would have a lot of other, more noticeable effects, some of which would themselves affect the ear. A mechanism that broad should be accompanied by a list of other expected symptoms- something the user can compare their own symptoms to and see if this offers a parsimonious explanation. TFoA does none of that. It offers no checkpoint for a user to say “oh, this isn’t me” and walk away. I didn’t consciously decide that that was the last straw, but I haven’t picked up the book since. And while I kept up with my old exercises, I didn’t work on incorporating new ones. This is to my detriment, since the exercises really do seem to help no matter how terrible the science they’re based on is. I have some hypotheses as to why that is, but I can’t share them without committing all the sins I just accused the book of, so they will need to wait for more research.